RayBiotech's Custom Sandwich-based Antibody Arrays use highly specific antibody pairs to detect over 1,000 different proteins for many different species. Choose from the matched antibody pair lists below and RayBiotech will print the arrays on either a membrane (chemiluminescent detection) or a glass slide (fluorescent detection) solid support. Quantitative custom arrays can be produced using the Quantibody Array platform on glass slide. 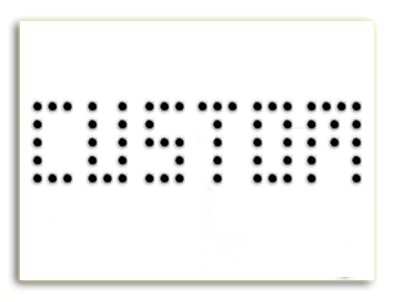 To obtain a quote please fill out the Custom Antibody Array Request Form. We also encourage you to use the Array Picker Tool to search our existing arrays by the proteins you select. 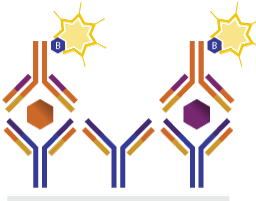 Create your custom array by choosing your proteins of interest from the antibody pair lists below. Unique target molecule offered exclusively by RayBiotech, Inc. The tables listed below are separated because of cross-reactivity. All 40 of the targets listed in table below are quantitatively detected by the Rat Cytokine Array Q4. Targets from both tables cannot be combined. The table listed below is separated from the one above because of cross-reactivity. All 27 targets listed in the table below are quantitatively detected by the Rat Cytokine Array Q3. Targets from both tables cannot be combined. Lee H., Lee JK., Park MH., et al. Pathological roles of the VEGF/SphK pathway in Niemann-Pick type C neurons. Nat Commun. 2014 Nov 24;5:5514. doi: 10.1038/ncomms6514. Cheng K., et al. Relative Roles of CD90 and c-Kit to the Regenerative Efficacy of Cardiosphere-Derived Cells in Humans and in a Mouse Model of Myocardial Infarction. J Am Heart Assoc. 2014;3:e001260, doi: 10.1161/JAHA.114.001260. Boltze J. Reich DM., Hau S., et al. Assessment of neuroprotective effects of human umbilical cord blood mononuclear cell subpopulations in vitro and in vivo. Cell Transplant. 2012;21(4):723-37. doi: 10.3727/096368911X586783. Keren Z, Braun-Moscovici Y, Markovits D, Rozin A, Nahir M, et al. Depletion of B lymphocytes in rheumatoid arthritis patients modifies IL-8-anti-IL-8 autoantibody network. Clin Immunol. 2009;133(1):108–118. Wohlauer M, Moore EE, Silliman CC, et al. NEBULIZED HYPERTONIC SALINE ATTENUATES ACUTE LUNG INJURY FOLLOWING TRAUMA AND HEMORRHAGIC SHOCK. Critical care medicine 2012;40(9):2647-2653. doi:10.1097/CCM.0b013e3182592006. Park et al. : Serum biomarkers for neurofibromatosis type 1 and early detection of malignant peripheral nerve-sheath tumors. BMC Medicine 2013 11:109.